* Andrew Sully and his wife Mary cut a cake to celebrate their new roles. * Mary with the Bishop of Bangor, the Right Rev Andy John. * The Bishop performs the induction service for Andrew and Mary. 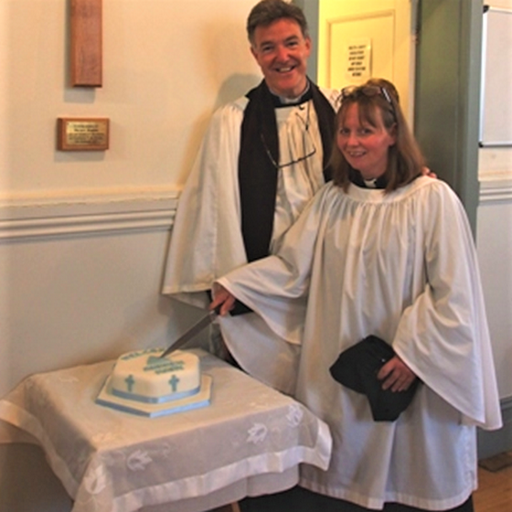 Former Llangollen vicar the Rev Andrew Sully was licensed and inducted as the new vicar and ministry area leader of Llandudno at an induction service. His new ministry area serves the northern part of Llandudno and the Great Orme, and includes Holy Trinity Church in the town centre and St Tudno’s Church on the Great Orme. 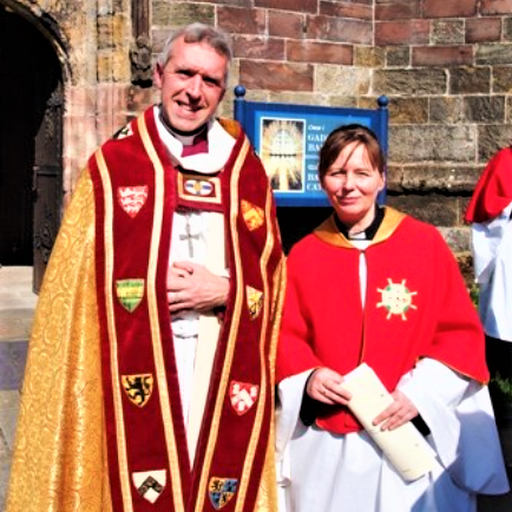 The Bishop of Bangor, the Right Rev Andy John, led the service, during which Andrew's wife, the Venerable Mary Stallard, the new Archdeacon of Bangor, was licensed as an associate vicar in Llandudno. Andrew and Mary have two daughters, Joanna and Carys. Mary will combine her new ministry in Llandudno with being Archdeacon of Bangor. 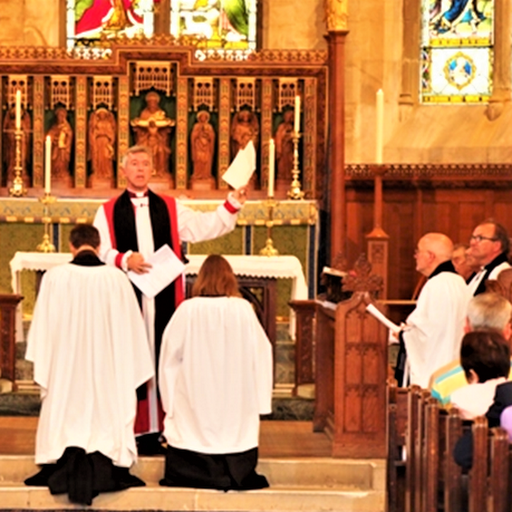 Sunday’s service was be attended by members of Cytûn Llandudno, as well as civic dignitaries. Pupils from Ysgol San Siôr, the Church in Wales primary school in Llandudno, also took part with a presentation for Andrew. Andrew was born in Germany and brought up in Newport. He studied history and theology at Southampton and trained for ordained ministry at the Queen’s College, Birmingham. His M.Phil. thesis focused on the poetry of R.S. Thomas. Following a curacy in Newport, he became incumbent of the Parish of Llanafan y Trawscoed with Llanfihangel y Creuddyn with Ysbyty Ystwyth and Gwnnws in the Diocese of St David's, where he also served as Diocesan Ecumenical Officer. In 2002, Andrew became Vicar of the Rectorial Benefice of St Asaph, also serving for a time as the North Wales Field Officer of Cytûn: Churches Together in Wales, and as a member of the Diocesan Parish Renewal & Development team. From 2006, he was Vicar of Llangollen, Trevor and Llantysilio, a role he has combined with service to the Provincial Environment Group CHASE, the diocesan link with the Diocese of South West Tanganyika, and chaplaincy ministry at Llangollen Cottage Hospital and Ysbyty Maelor. Andrew, a Welsh-language learner, is now a fluent Welsh speaker. Speaking of his new appointment Andrew said: ‘I’ve spent a decade and more ministering to tourists and visitors to Llangollen, a town where Wales welcomes the world. "Llandudno has even more visitors as North Wales’s premier seaside town, and so the opportunity of welcoming and connecting with a large number of new people gives the Church a huge opportunity of presenting Christianity to people in a vibrant and fresh way. "Having been fortunate to have worked with some outstanding musicians and choirs in recent years, I’m particularly looking forward to being part of the fine musical tradition at Holy Trinity Church. Good music gives worship its texture and depth." The Bishop of Bangor said: "Andrew brings great experience to his new role in Llandudno. His ministry has been marked by a desire to find new ways to make Christianity and Church relevant, and commitment to ecumenism and environmental issues, all of which is underpinned with his interest in Taizé and spirituality. I’m really looking forward to seeing how Llandudno develops under Andrew’s ministry. "Please do pray for Andrew and Mary, the people of Llandudno, as well as the people of Llangollen."